Once you receive your approved NDIS plan, you will need to go through some steps to implement your plan, before you can start using your NDIS funded supports. 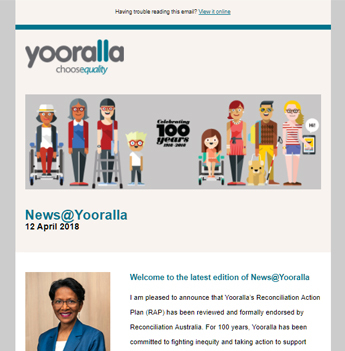 Yooralla's free guide to Implementing your NDIS plan will give you more information on each of these steps. When you receive your approved plan in the mail or by email, you need to read your plan and understand your supports. If you need help interpreting your NDIS plan and understanding your supports, contact your NDIS representative. Your plan starts (and is considered active) from the date the plan is approved – this date is listed on the front page of the plan. It is important that you go through the steps to start using your NDIS plan as soon as you receive it, so your supports can continue. To look at your plan and manage your supports you need to go to the myGov website and have your myGov user name and password ready. If you don’t already have a myGov account, you can create one on the Department of Human Services website. From the myGov website you can then link to your NDIS participant portal, ‘myplace’, where you can view your NDIS plan. The letter that comes with your plan will include an activation code you need to use to access myplace. You should access myplace as soon as possible, as your activation code will expire within approximately 10 days. If you haven’t used the code within the required time, you will need to contact your NDIS representative. At your planning meeting you would have decided who you want to help you with the next steps to start your plan and start receiving your supports. You will need to decide who you want to deliver the funded supports in your plan, and then sign Service Agreements with your chosen provider/s. To continue with your existing service provider you still need to contact them to enter into a Service Agreement before you can start receiving supports with your NDIS funding. If you want to use a new provider, you can search for other providers in a number of ways. Once you have signed and returned your Service Agreement/s to your chosen providers, then you will start receiving your NDIS funded supports. Your NDIS plan runs for 12 months, unless there is a significant change in your life in the meantime that will require a change in your supports. For more information on the steps involved in implementing your NDIS plan, download our free guide to Implementing your NDIS plan. What should I look for in a service provider? What is a Service Agreement and why do I need one? Once you have chosen a service provider/s, you will sign a Service Agreement with them. A Service Agreement is a contract between you and the service provider, which will outline how they will deliver the supports in your NDIS plan. A Service Agreement will describe what supports will be provided, what they cost, and how they will be paid for, as well as relevant terms and conditions. You can choose one service provider to deliver all of your supports, or different providers for each of your supports. Yooralla is able to provide many types of supports, and this can be covered in one Service Agreement. If you are not happy with your NDIS plan, you can contact your planner or the NDIA to discuss the things that you are not happy with. Information about how to do this is on the cover letter with your plan. Or you can submit an application for an internal review through the NDIA. Even if you are not happy with your NDIS plan, it is important that you take the steps needed for you to start using your NDIS plan as soon as you receive it, so your supports can continue.